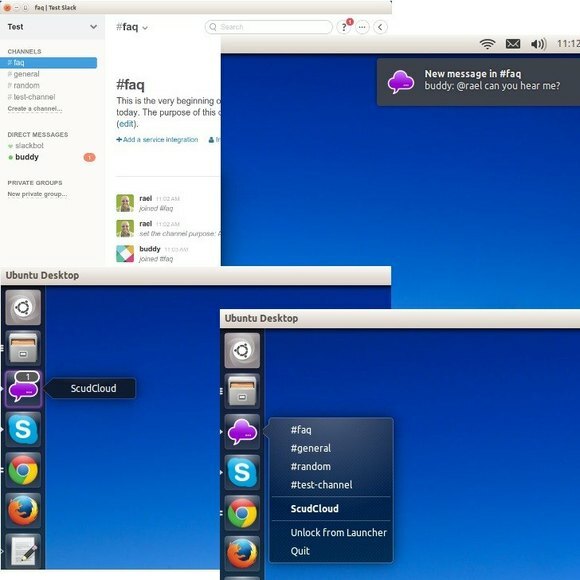 ScudCloud is an unofficial, open-source Ubuntu Linux desktop client for Slack team communication tool. Slack is a team communication tool founded by Stewart Butterfield, it offers one-on-one messaging, private groups, persistent chat rooms, direct messaging as well as group chats. All content inside Slack is searchable from one search box. Slack integrates with a number of third-party services, including Google Docs, Dropbox, Heroku, Crashlytics, GitHub and Zendesk. and channels quicklist at launcher icon. Ubuntu users can easily install the client from the developer’s PPA. So far, Ubuntu 14.10, Ubuntu 14.04, Ubuntu 12.04, Ubuntu 10.04 and derivatives are supported. For those who don’t want to add PPA, grab the .deb package directly from this page and install it via Ubuntu Software Center. I’ve had some issues but I can’t figure why, the thing is that when I’m trying to launch scudcloud it run an empty window with nothing in it, just a white screen app.